The class you have been waiting for is finally here!! Perfect for Valentine treasures . . . 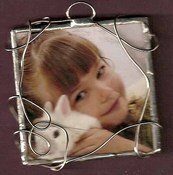 Learn how to use soldering techniques to make charms and frames, perfect for holding your photo, collage and Zentangle art! We'll spend the 1st part of the class making some quick collages to practice on and then cover the how-to's with copper tape, flux, jump rings, wire dangles, crystals/beads, solder and polish! It's the perfect time of year to share your artwork as Christmas gifts -- and soldered frames make beautiful ornaments when you hang crystals from them! Supplies will be available in the studio for future projects - check out our studio times through the end of the year for practicing -- as well as supplies for sale.